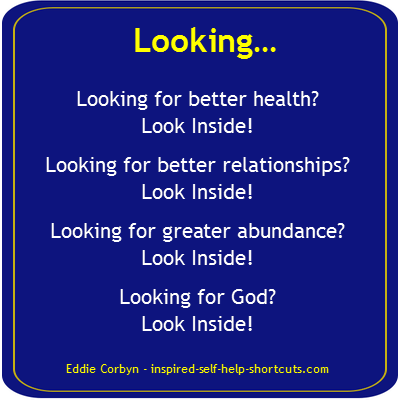 Inspired Self Help Info Shortcuts To Remembering The Game Of Life! The Game Of Life Is All In Your Mind! This inspired self help info shortcuts page serves as an introduction to other areas of this website. My intention is to remind you and help you to realize that through the experience of living our life, each of us picks up many inaccurate beliefs, false truths and misconceptions about what life is and what it means to have a life experience. Throughout this self help website my intention is to share with you, what I believe and what I know beyond belief concerning what life is and isn’t. Additionally, I impart knowledge that helped me to understand, which means to remember, and thus to realize what the purpose of having a life experience really is. And so, by considering, remembering and implementing the ideas revealed by these inspired self help info shortcuts, you’ll be fully self-empowered to make new decisions concerning the direction of your life. And by using this freshly remembered knowledge, you’ll see through many of your previously held misconceptions. To be clear though, nothing I’ll be writing is actually new to any of us. Because at some level of our being, each of us already knows and understands all that I’ll be saying. Thus, when you recognize certain things that I say as being true, it's because you already know that truth; how else can you really know truth? However, for the purpose of playing the game of life it was necessary for us to forget many of life's greater truths. The most important thing I want to remind you of is about the existence of your own spiritual or higher self. Thus, this self help website focuses on both our personality self and our higher self. Our higher self is that part of us which knows the best way for us to achieve anything in our life and how to get there in the fastest time. Many years ago I realized that to solve any problems or challenges we need to get to the root cause of them. Through introspection, research and study I began inquiring into the challenges of my own life and I discovered that my own mind was the root cause of all of my problems! It’s easy to look at your life and lay blame for your current circumstances outside or upon another, but the truth is while everyone has challenges, problems are self-created by the thoughts we habitually think and are sustained by the beliefs we hold. On a deeper level there is no outside! Furthermore, it’s understood that not everyone needs to hear anything I may say. For instance: consider the analogy of a simple sheep herder in the remote hills and valleys of the northern Himalayas or some such place. The sheep herder awakens every morning and he loves the nature all around him, he loves his life. The snowcapped mountains, trees, plants, grasslands and animals all inspire a feeling of love and oneness with nature within him. He loves his life and enjoys every moment of being alive. From his perspective nothing more is needed, there’s nothing to add, his life experience is all good. Conversely, this inspired self help info page points out that others, who are living in larger communities and interacting with many people, through family, work, jobs and business in their daily life, may be experiencing stressful and undesirable situations. If you’re anything like me you’re passionate about being reminded of the important things in life, and you want to understand who you really are and what life really is. That’s my primary intention of communicating this knowledge and these ideas to you. A big part of knowing who we really are is in the realization that we all create our own experience of reality. Actually, it’s more accurate to say that we choose which part of creation we now want to experience as I’ve explained in the deeper level Reality Paradox section. This inspired self help program page from the LOA Success section clarifies conscious deliberate reality creation. And why is it important to know that you create your own reality? It’s important because once you remember this point; you realize that you wouldn’t have created an experiential reality unless there was something in it for you. Put another way, you wouldn’t create it unless it contained something that you wanted to learn or remind yourself of. And in turn this means that any reality you’ve created and are currently experiencing is OK. There’s nothing wrong, everything is how it’s meant to be, everything is how you wanted it to be in order for you to learn from it or remind yourself certain things from the experiencing of it. Of course, at this awakening stage you may not be consciously aware of this truth, but as you do remember and become more consciously aware, you’ll remember your higher self and that will help you to realize that your higher self knows exactly what’s best for your total being, as explained in the deeper level Reality Paradox section. Furthermore, this self help info suggests that having this realization also means you'll know that if you’re unhappy with your current life experience, you and you alone have full power within you to change your current experience into something that you say you now prefer by simply changing your mind. You are an eternal dreamer within your dream! Observe your reaction from reading what’s been said so far, how does it feel to you? Does it feel good and sound about right? Or is there a knot in your stomach and thoughts like: 'who does he think he is' or 'what planet is he from' or something similar? Whatever you’re feeling it’s tied to your thoughts and beliefs that you may have unconsciously picked up from your family, your friends, the education system, social conditioning, your government and through your life experience etcetera. It’s perfectly normal to have and hold beliefs, we all have them. Beliefs make things and beliefs make the world as it is today. But what is a belief and are your current beliefs serving you or hindering you? A belief starts as a thought about how you’ve defined something. This self help free page from the LOA Success section explains how to redefine your beliefs to better serve you. Continually thinking about and defining something eventually becomes your belief about it, but are your current beliefs actually serving you? Let’s say that when you were a child, you often heard a parent complaining that money is hard to come by or that rich people are all crooks or something similar. Due to your innocent nature as a child you may have picked up these beliefs and you continue to hold on to them to this day, without ever having really examined them. Now, as an adult, imagine that a rich person offered to work with you in some way on a project that they said will be mutually beneficial. However, due to your belief about rich people, you didn’t act and declined to work with this person. In this case, your belief served as a filter that influenced your choice. However, this inspired self help info shortcut indicates that you may have passed up an excellent opportunity to make a lot of money. Don’t forget that your parent’s belief isn’t necessarily true; there are thousands of extremely rich people who made their fortunes by honest means. So in this example your belief may not have served you. I want to remind you that in our world there’s much misinformation, deception, corruption, propaganda and outright lies, so when it comes to the important issues in life it pays to have an open and discerning mind! There’s some confusion about the words: skeptical, cynical and gullible, so I’ll define them in the sense that I mean them here. A cynical person is a pessimist whose mind is closed and who is unwilling to examine other belief systems. Rather, cynics prefer to lump anything outside of their own belief systems into a box along with fables and fairy tales. A gullible person accepts any and every idea as true without any proper inquiry or examination. Both cynicism and gullibility fall into the category of ignorance! On the other hand, a skeptic has an open mind and is willing to examine. A skeptic doesn’t assume one way or another and he doesn’t pre-judge new ideas, but rather, he listens to them and finds out for himself the truth or the falseness of those ideas. Thus, having a skeptical mind is the preferred state! Or in words which are useful for understanding what I’ve said above: even though most people believe that hard work is necessary to make money, it doesn’t mean they are right. And just because it’s not yet common knowledge that we create our own experience of reality, it doesn’t mean it’s not true. As human consciousness once again expands into the knowledge that has heretofore been forgotten, many questions about the greater meaning or'no meaning' of life begin to surface. I’ve noticed that for some people this new awareness can sometimes be confusing, stressful or even frightening. For this reason I’ll take the opportunity on this inspired self help info page to remind you that remembering this previously forgotten knowledge is not a race. You can only handle so much new data at a time and some foundational information needs time to be assimilated into your awareness, before you'll be able to move beyond it. Take it slowly and relax into it, while holding the realization that: you’ll know what you need to know at the time that’s right for you and not before. As we examine and join more of life’s dots, more of life’s big picture is revealed to us. And this inspired self help info shortcut advises that, just like the dot joining picture game, once we’ve joined a certain amount of life's dots, life's big picture becomes very clear and unmistakable. The more I see of life’s big picture, the more I realize that life is a game of remembering, remembering that which we all, inherently, already know. At the same time, I want to remind you that remembering also means that as we get more in touch with our higher or spiritual self, who we really are, in a sense we’re becoming aware of and re-connecting or re-membering with the greater part of us, we’re waking up. Can you really afford to dismiss what I'm saying on this self help info page and on this inspired website as nonsense? Or are you ready to open your mind to new ideas and to examine your thinking, your thoughts, your beliefs and your behavior and change them to better serve you? If you're ready, then together, on this self help gurus page we’ll discover what is true and what can be recycled or discarded as it no longer serves us. And then on this inspired self help worksheets page I remind you about the new rules for playing the new game of life on earth. I'd love for you to join me on a journey through this website's inspired self help info and for you to use the shortcuts that will enable you to re-mind yourself to re-member and be who you really are.